With this UN photo, you can see the pain in the woman’s face as she grimaces while receiving treatment at a medical clinic in Port-au-Prince. 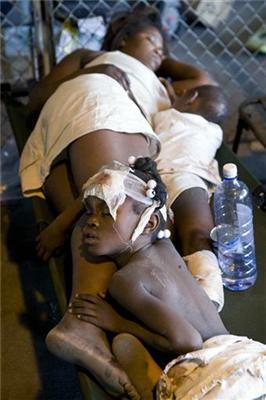 This handout photo captures the scene of a mother and two children as they sleep on a bunk after receiving treatment at a medical clinic at a MINUSTAH (United Nations Stabilization Mission in Haiti) logistics base after the quake. This is very sad. 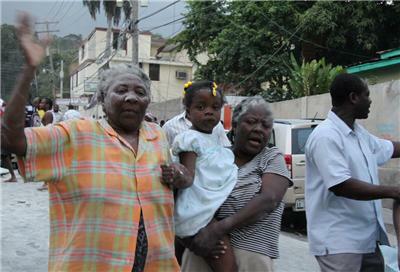 I will make a heavy prayer for all people in Haiti. God Bless for all media to keep us notified about the earthquake. Thank You. 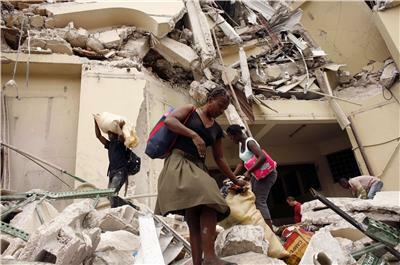 Residents loot food from the destroyed Caribbean supermarket in downtown Port-au-Prince, in this photo taken by Reuters photographer Eduardo Munoz. 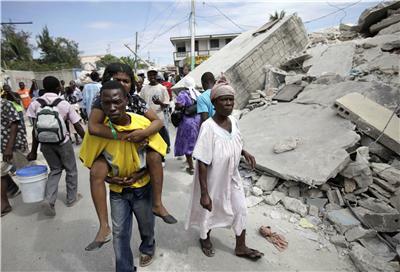 Reuters photographer Jorge Silva captured this image of a man carrying an injured person along a destroyed area.